For those who yearn to live and build in balance with nature ... this is Nehalem Point, a green peninsula in the heart of Nehalem Bay on the magnificent coast of Oregon. This is the land of ancient Spanish galleons, shipwrecks, buried treasure, wonderful legends, Native Americans, and western pioneers. This land, beautiful and unblemished by its history, promises a future that preserves the natural beauty, the elk grazing in the meadow, the wild birds, estuary, dikes, the trails, the native plants — all for you. Nehalem Point is located on the North Coast of Oregon, in the town of Nehalem. Our treed homesites are bounded on one side by the Nehalem River, and on the other by Nehalem Bay as it opens into the Pacific Ocean. Residents can walk miles of trails, see elk roaming in the meadows, view hundreds of birds feeding in the estuary, kayak, fish, crab and tour the nearby Nehalem Bay State Park. 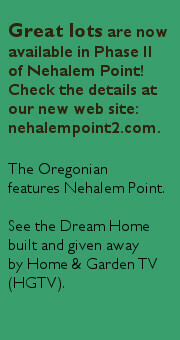 We invite you to explore the beautiful natural environment surrounding Nehalem Point.